Soursop (Graviola) is a tropical fruit that has a long history of use in herbal medicine. Soursop tea has been used for its stress-relieving properties for centuries and is purported to reduce anxiety and improve insomnia. Evidence from in vitro and animal studies suggests it has benefits for reducing inflammation, supporting the immune system, alleviating pain and promoting a calm mind and body. Research has also examined the effects of Soursop on cancer cells, respiratory conditions, combatting parasitic infections, and supporting gastrointestinal health. Soursop or Graviola has been widely touted as a natural remedy for cancer. One randomized controlled trial showed higher cytotoxicity of colorectal cancer cell lines when given a Soursop leaf extract. This article explains what researchers know about the physiological effects of soursop fruit and leaf extract. Traditional uses, mechanisms of biological action, possible health benefits, recommended dosages as well as possible side effects and interactions will also be discussed. The plant that soursop fruits are harvested from is called Annona muricata in botany. Many people refer to soursop as “graviola”, which is the plant’s Brazilian name. In some other Spanish-speaking countries, it is referred to as guanábana. The Raintree Tropical Plant Database (RTPD) states that different part of the soursop tree are used for different purposes in herbal medicine. While there is a wide range of traditional uses for this fruit, there is limited clinical research available to evaluate how it works in the treatment of human health conditions. The FDA has not approved Soursop extract as a drug for the treatment of any medical conditions. Note that there is no reliable evidence from human trials to support most of these uses. While research studies demonstrate potential benefits for mood, blood pressure, parasites, cancer and other disorders, most of these studies have been in-vitro or have involved animals. In order to validate the claims made about the health benefits of soursop supplementation, more human research studies are needed. How does Soursop Work Inside the Body? These mechanisms are listed in order of their respective quality of research support from cell and animal studies. According to Memorial Sloan Kettering Cancer Center (MSKCC), soursop fruit, leaf, bark, twig, seed and root contain chemical compounds called annonaceous acetogenins. There is concern over toxicity associated with large dosages of some of the alkaloid constituents of soursop fruit. However, there has been a significant amount of preliminary research in in-vitro laboratory studies and animal research. Here are some of the most prominent findings from these studies. 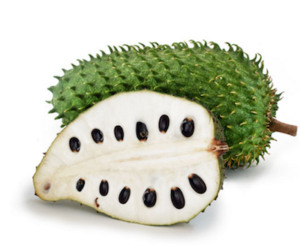 The Memorial Sloan Kettering Cancer Center says that one type of soursop extract showed anti-ulcer effects, which means that it may help in the treatment of peptic ulcer disease. This purported benefit is attributed to the fruit extract’s ability to increase NO (nitric oxide) synthesis. This results in vasodilation, which is the expansion or widening of blood vessels, resulting in increased circulation. Soursop is widely discussed as a fruit that exhibits cancer-fighting properties. But is this claim a hoax? While some research shows that it has anti-cancer effects, this does not mean that it will work as a cure, treatment or prevention for cancer in humans. The extract is believed to inhibit the growth of malignant tumor cells by limiting their supply of ATP (adenosine triphosphate), the body’s main energy currency. Significantly more research is needed to understand how soursop supplements may affect cancer cell growth and whether this product has any clinical efficacy. The FDA has not approved Soursop extract as a drug for the prevention or treatment of cancer. You should be wary of any natural health products that claim to tout anti-cancer effects in humans. This fruit extract has been associated with various health benefits through hundreds of years of traditional usage. There is also some supporting evidence of positive effects provided by cell and animal studies. The abive proposed health benefits of soursop fruit supplements are based on traditional usage in herbal medicine, word-of-mouth, and research in cell in animal studies. Large-scale, randomized, placebo-controlled, double-blind clinical trials are needed to evaluate health benefits in humans. Seek medical advice about any specific medicinal use of this dietary supplement from a qualified healthcare practitioner. Soursop or Graviola supplements are typically sold in dosages of 500 mg, 600 mg or 650 mg per capsule or tablet. The typical serving size is between 1000 mg to 1300 mg per day. Follow dosing instructions on soursop supplements you buy, unless your doctor tells you to dose differently. NMCD mentions no oral dosages of soursop fruit that have been used in studies. However, the flesh of soursop fruit has been used historically for wound healing. RTPD advises that soursop fruit supplements are most commonly used to inhibit ATP production in tumor cells and should not be taking along with coenzyme-Q10. RTPD reports that soursop fruit is used to make candies, smoothies, ice creams, desserts, sherbets and various beverages. Soursop recipes can be prepared in many ways from the raw fruit at home, but it is typically used to make juices and smoothies. It can also be prepared into a cake or pie filling. Soursop fruit and leaf supplements are growing in popularity, especially because of their purported anti-oxidant effects. Soursop supplements are available in powder, capsule, tablet, extract and tincture forms. Look for organic, non-GM, and toxin-free products from trustworthy merchants. Store your dietary supplements according to label directions; or in airtight containers out of light or heat. You can also buy this fruit in the form of tea bags, bulk tea leaves, soursop nectar, concentrated juice, seeds, bulk powder or in liquid drops. According to the NMCD, soursop supplements are rated as Likely Unsafe when used orally. Higher doses of soursop fruit might cause gastrointestinal upset, nerve dysfunction, low blood pressure, or myeloneuropathy of the optic nerve. In some animal studies, long-term use of soursop fruit juice seems to promote the production of RNS (reactive nitrogen species). OVERVIEW: Soursop, also known as Graviola, is a small evergreen tree that is native to tropical areas of North and South America. The leaves, fruit, seeds, and stems are used to make medicine. USED FOR: Antibiotic, Sedative, Antiparasitic, Cathartic (promotes defecation), Emetic (promotes vomiting), Coughs, Catarrah (mucous membrane inflammation), Herpes, Cancer, Arthritis. MECHANISM: Historically graviola has been used as an internal and external antibiotic; in lab studies it has been shown that graviola has some antibacterial, antifungal, antiparasitic, and antiviral effects. However, large doses of graviola may cause nerve disorders and degeneration; more research is needed. DOSAGE: 2-4 mL of a 1:2 tincture, three times daily (dosage based on historical use). As a dietary supplement, it is typically provided in dosages of 500mg - 1300mg per serving. SIDE EFFECTS: Rated as Likely Unsafe when used orally. According to historical use, it is generally well tolerated in amounts found in food. High doses may cause gastrointestinal upset, high blood pressure, neuronal movement disorders similar to Parkinson's disease, and kill nerve cells in the brain and nervous system.